Take a look at this spacious three bedroom, two bathroom condo at Inlet Reef, room 619. Multiple views abound in this sixth floor condo. The kitchen has plenty of counter space, full size appliances, and all the pots, pans, plates, dishware, and silverware needed to prepare your favorite feast. There are two separate Dining Areas on either side of the kitchen, with their own dining tables. The smaller dining table seats four and offers impressive views of the Destin Harbor and Destin Bridge. The large dining table seats six guests, with adjacent bar seating, ensuring you’ll have no issue of cramped eating space. 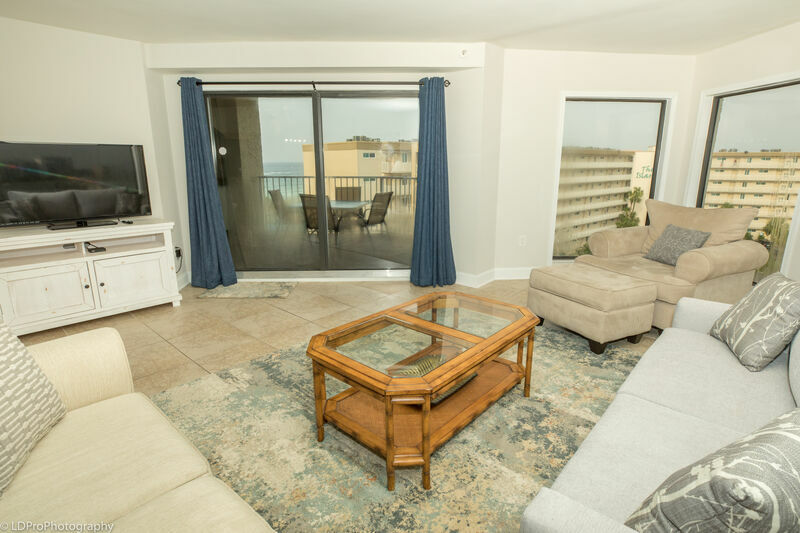 The open Living Room is home to a wraparound couch that doubles as a Queen Sofa sleeper, three chairs, a big screen HDTV, a DVD player, balcony access, and views of the Destin Bridge, the East Pass, and the Gulf of Mexico. The Master Bedroom has a King bed, balcony access, and a wall-mounted flat-screen HDTV. The Master Bathroom has a preparation area, two separate vanities, and a bathtub/shower combination. The first Guest Bedroom has a Queen bed and a wall mounted HDTV, while the second Guest Bedroom is where you’ll find the two Twin beds, a flat-screen HDTV, and a DVD Player. The Guest Bathroom has a bathtub/shower combination. The best part of this condo is the balcony, where you will find spectacular all-encompassing views of the Gulf of Mexico, the East Pass, the Destin Bridge, and the Destin Harbor. There is also a wet bar on the balcony for easy drink preparation. This condo also comes with a full size washer and dryer, as well as complimentary Wi-Fi internet access. Eight Guests can relax in comfort in this fantastic Destin getaway location. You'll be feeling sublime in 6-1-9, so book now!